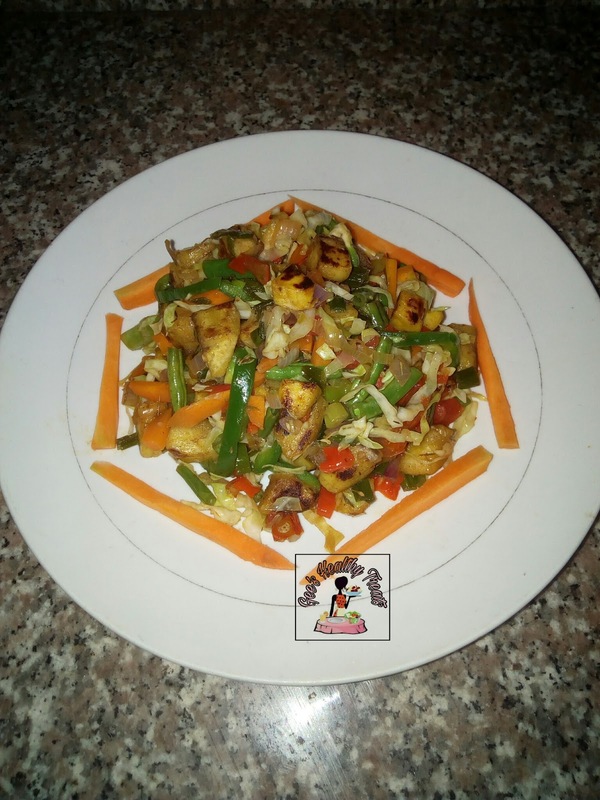 Today am going to be sharing with you all a very easy recipe (Diced Grilled Plantain in Mixed Vegetables) that can serve as breakfast, lunch and even dinner. This meal Contains the right amount of carbohydrates, iron, potassium (to help maintain healthy blood pressure), fiber, vitamin A, C and E.
1/2 cup of sliced spring onions. 1 small green pepper cut into strips. 1 cup of green beans and carrot strips. 1/2 cup of sliced cabbage. 1 teaspoon of sliced scotch bonnet (pepper). 1 tablespoon of olive/coconut oil. Cut Plantain into to cubes, grill for 10-15 minutes and set aside. Add oil to pan and allow to heat, add a pinch of salt, onions and allow to simmer for 30 seconds. Add spring onions, green beans and carrot strips, scotch bonnet and allow to simmer for 2-3 minutes. Add tomatoes, curry, thyme, seasoning, grilled plantain allow to simmer for 5-6 minutes to enable the plantain absorb the flavor from the vegetables. Add green pepper strips, cabbage, stir, allow for another 2-3 minutes and turn off heat.